The era of cohabitation with robots has just begun. After Pepper, Asimo, Oz, Nao and friends, meet a new French robot. Its name is Spoon, and it has the appearance of an artificial pet. What singles it out is its emotional dimension: it adapts to its environment. We interviewed its creator, Jérôme Monceaux. More than a mere robot, Spoon is part of a new robot species which has been developed for a year now by ex-Aldebaran colleagues. Associated with UR Link for a few months, the accelerator of the Unibail-Rodamco group, and incubated at 104Factory, Spoon’s unique purpose is to create a robot with emotions and close to human beings. For the record, Jérôme Monceaux did a little experience: he left 11 robots in a room during lunch time. When he came back and opened the door, the 11 robots turned around and stared at him. “At that point I felt something quite strange and quite intense: emotion facing all those robots who were looking at me. I then realised that what interested me was not the robot, but how human-beings felt in front of it. Social science applied to robotics.” the cofounder explains. For its first year of existence, the team has three main goals. Pushing the boundaries of robotics and develop the interactivity between human-beings and machines. Not looking to replace human-beings by robots, but striving to enrich and promote interactions between individuals. In order to reinforce Spoon’s emotional and non-humanoid dimension, the team opted for the most elementary form in terms of robotics: a backbone topped by an interactive head. “We made this choice because the abilities of a humanoid robot would be a disappointment: when people see a small robot with a human appearance, they expect it to have all the capabilities of human beings. Most of the time, they are disappointed. Human beings, monkeys, cats or dogs are perfect, why would anyone want to reinvent them with robots? Furthermore, if we start giving a humanoid form to Spoon, we feed into the hollow debate of replacement of human beings by robots, which we refuse to be part of.” – Jérôme Monceaux. Thanks to a a very creative approach, the startup gave birth to a whole new and unique species of machines: around 1m40 of advanced engineering to interact easily with children and extend if needed for grown-ups. According to Jérôme Monceaux and his team, the robot only becomes interesting if it talks to the community around it on a local scope. He needs to feed on its environment and create value and interactions from its location. By learning continuously – with a machine learning approach – from its surrounding community, Spoon’s knowledge becomes increasingly unique and contextual. “We don’t want the robot to deliver corporate content only, for commercial or event promotion purposes. In the contrary, with Spoon, we want the robot to be an active and contextualised messenger, just as a local social network would look like, but in a more lively way. We believe that the only viable robot must build its knowledge from individuals around it to gain the trust of the people.” – Jérôme Monceaux. 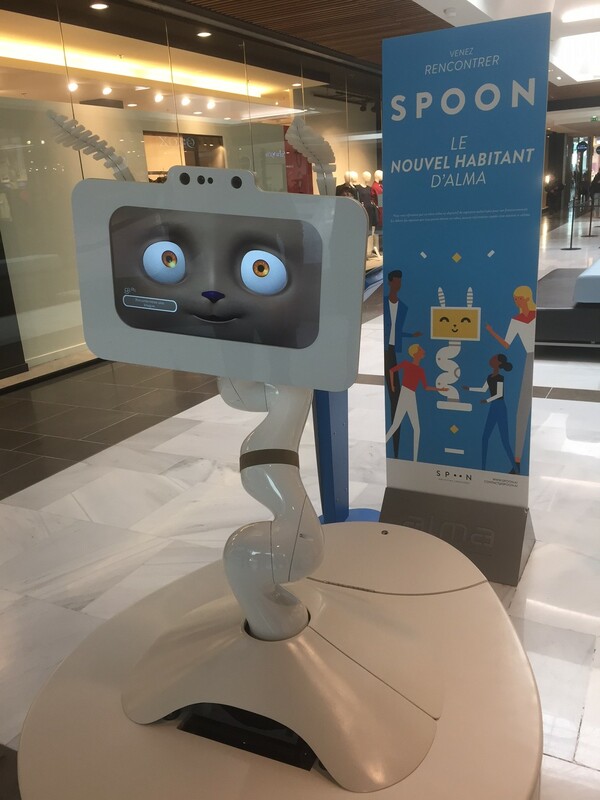 For its first outdoor activity, Spoon was invited to establish in the Unibail-Rodamco Rennes-Alma shopping centre for 3 weeks, to test its presence with potential users in a real-life situation. “Spoon lets us experiment the usage of robots and of artificial intelligence in our malls. Thanks to this new artificial creature in the Rennes Alma shopping centre, we can study the reaction of customers and understand how we could potentially use robots along with human presence on the premises. We are confident that this approach with successive experimentations will let us develop more innovative services at a faster pace, and satisfy better the needs of our customers.” Matthieu Nicoletti, Director of UR Link, explains. Spoon will be around to inform clients and accompany them during their visit. As the days pass, it will learn from the people it meets and from the questions it will be asked, and it will eventually become useful for others, just like a full member of the community. This article was initially published in French, in Maddyness on February 9th 2017.